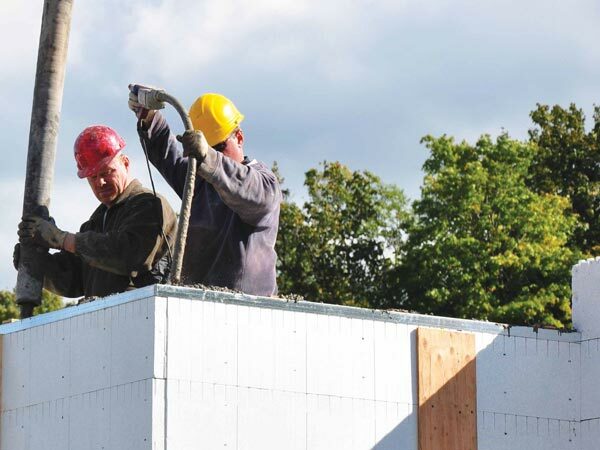 According to a new study sponsored by the EPS Molders Association (EPSMA), expanded polystyrene foam (EPS) is one of the most sustainable building products in the world. The study, titled Energy and Greenhouse Gas Savings for EPS Foam Insulation Applied to Exterior Walls of Single Family Residential Housing in the U.S. and Canada, found that the energy and emissions used to create EPS is far outweighed by the environmental benefits of its insulation. EPS insulation can return up to 200 times the amount of energy required to produce it, and can reduce emissions by up to 100 times when compared to the emissions produced during the manufacturing process. The life cycle study concluded the savings from adding EPS insulation are both substantial and rapid, providing a 100% payback anywhere in North America in less than two years. It also provides significant energy savings and greenhouse gas reductions over the long-term. Franklin Associates, an independent consulting firm in Prairie Village, Kansas, conducted the study. In a bid to attract new and former members, the Insulating Concrete Forms Association (ICFA) has significantly revised its dues structure. The new system still has six different membership categories, but unlike the old system, the cost of membership is proportional to the size of the business. “Primary Members” have been rebranded “ICF System Members,” and dues in this category are based on product volume shipped semi-annually. “Associate Members,” which provide raw materials to the industry, pay only $500 under the new system if gross revenue on ICF-related business is less than $1 million annually. This is a significant decrease from the previous $3,000 flat charge. Contractor, Distributor, and Professional members all fall under the same dues structure. 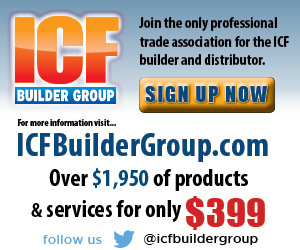 If ICF-related business is less than $1million annually, dues is $250. For revenues between 1 and 2.5 million, dues is $500. Steve Heller, executive director at ICFA, says most former and potential members will find the change significantly reduces the price of membership. He expects rising membership numbers to offset the lower dues. For membership information or to view the entire dues structure, visit www.forms.org. As reported in the Dec. 2008 issue, the 2009 International Residential Code will require automatic fire sprinklers in all new one-and two-family homes. The vote would have failed by 2-to-1 margin if not for the sudden appearance of more than 900 fire officials who voted, then left the meeting. Now the NAHB has filed an appeal, claiming the International Code Council failed to provide a fair and open voting process during the final hearing in September. The ICC has not yet set a date for hearing NAHB’s appeal. However, interested parties are invited to respond to the appeal by submitting their views in writing to mpfeiffer@iccsafe.org and to participate in the appeals hearing. Logix Insulated Concrete Forms Ltd. will begin manufacturing in Hawaii effective July 2009. The plant will manufacture a full line-up of 6.25” and 8” knockdown blocks. The company anticipates adding other elements to the product line over time. “Establishing manufacturing in the state of Hawaii is the next stage of our expansion plan,” notes Andy Lennox, vice president of marketing at the company. “We’ve recently added manufacturing capabilities in Minnesota and in California, as well,” he notes. With the expansion, the company is actively looking for a Territory Manager to oversee operations in this Pacific paradise. Distributor inquiries are also welcome. Interested parties should contact Cooper Stewart at 218-863-1152. LiteForm Technologies has launched an initiative to use 100% recycled (re-grind) EPS (Expanded Polystyrene) in selected lines of their ICF forming systems. According to the company, the move was prompted by environmental concerns about depleting and wasting valuable resources. New molding equipment and processes allow this Nebraska-based firm to intercept EPS scrap from local building contractors and incidental “consumer” scrap and recycle it into durable EPS building products. EPS scrap from LiteForm’s operation is automatically captured and recycled also. Currently, this discarded EPS is a major contributor to local landfills and dumps. Lite-Deck Top Hats made from 100% regrind are already available. The company is currently expanding the process to other product lines. MillenniumBlok, which makes a cement-EPS composite ICF, is beginning manufacturing operations in China. According to David West, owner of the Colorado-based company, molds for the pilot plant were shipped last month, and plans are in place to expand to 22 manufacturing facilities in China over the next several years. The National Ready Mixed Concrete Association (NRMCA) has added another title to its popular pitch book marketing tools. The new Insulating Concrete Construction book is designed to be an easy-to-understand overview of how to build energy efficient and disaster resistant concrete commercial buildings. 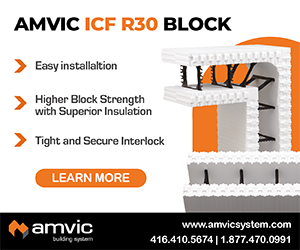 Designed for owners, architects, and commercial developers unfamiliar with ICFs, it lays out the benefits and features of insulated concrete buildings. Even the newest ICF salesperson or concrete promoter can speak with confidence, thanks to the book’s everyday language and explanatory graphics. The professionally produced flipbook can be presented over a cup of coffee, during a one-on-one meeting, or customized with a company-specific logo. A PowerPoint presentation (on disk) is included with the flipbook for an even more effective lunch-and-learn presentation. Like other flipbooks, each page presents attractive, clear and compelling information about the product on the viewer’s side of the page, while the reverse contains additional information only visible to the presenter. “This helps every promoter stay organized, reinforce the key points and also cover additional helpful information to support the specifier,” says Jon Hansen, who developed the flipbook in conjunction with the editor of ICF Builder Magazine. Quad-Lock Building Products, an ICF manufacturer based in British Columbia, has been recognized for it’s new R-ETRO insulation system. R-ETRO consists of EPS panels that are mechanically fastened to exposed concrete walls. 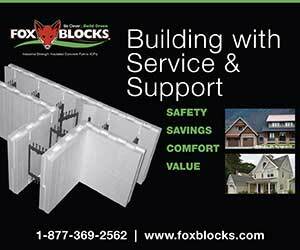 Whether used for remodeling or to furr out basement walls poured with removable forms, it provides many of the benefits ICFs offer. As part of the recent economic stimulus legislation, energy efficient commercial buildings can qualify for a tax deduction. If the building saves 50% on energy costs, the owner could save as much as $1.80 per sq. ft. A smaller deduction can be taken for less efficient buildings. Before claiming the deduction, the owner must obtain written certification from a professional engineer not related to the company, using approved software that the required energy savings will be achieved. For more information, consult with a qualified accountant about the Section 179D(a) deduction. It is set to expire at the end of 2013. Federal, state, and municipal governments currently offer a number of temporary programs beneficial to ICFs. The incentives are designed to jumpstart the sluggish construction market, which is a major factor in the current economic slowdown. In addition to the first-time homebuyer credit offered by state and national government, there are a host of energy credits that ICF buildings can easily qualify for. Additional details on these programs can be found online at: www.doe.gov, www.energystar.com, www.cra-arc.gc.ca/hrtc, www.ecoaction.gc.ca/ECOENERGY-ECOENERGIE/index-eng.cfm. BuildBlock Building Systems LLC, now offers software to help architects better understand the benefits of ICF construction. The company has partnered with Architecture Demarest to create 3D models of their products which will aid architects in the design phase of their projects. The files can be downloaded free on from the BuildBlock website: www.buildBlock.com/designitforlife. The software uses state-of-the art Building Information Modeling (BIM) to help architects and engineers with collaborative design, efficient documentation and concise construction. Spurlock states that BIM and Autodesk Revit Architecture software makes sustainable design, clash detection, and construction planning, easier.